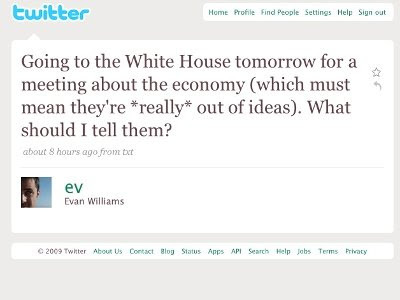 Twitter cofounder and CEO Ev Williams is headed to the White House today. The administration invited him to join a “young business leaders" summit to discuss the economic crises. As Ev himself puts it -- in a Twitter message, of course -- "[this] must mean they're *really* out of ideas."